By now, you’ve probably heard it’s a women’s all-American semifinal at the U.S. Open. 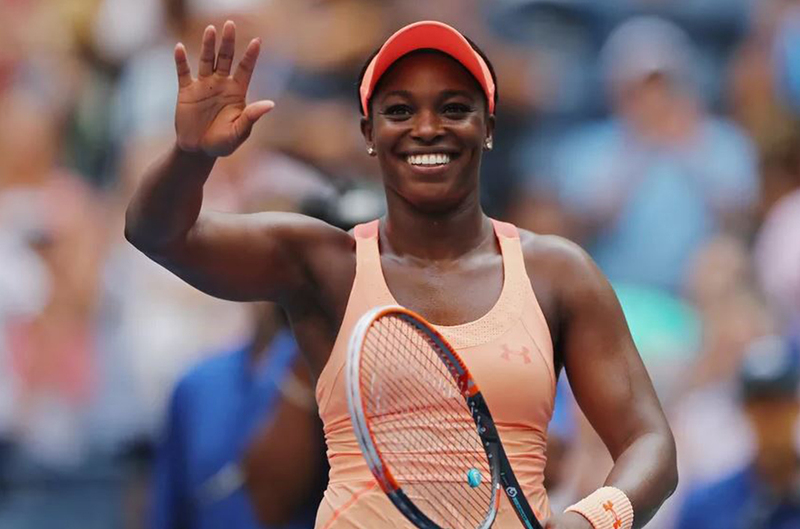 Sloane Stephens is one of those women taking center stage, hoping to become the first American woman not named Venus or Serena to win a major in 15 years. In fact, Stephens captured the attention of the tennis world, and beyond, when she beat Serena Williams in the quarterfinals of the 2013 Australian Open. So, let’s get to know this 24-year-old from Plantation, Florida a little better, including how she gives back to her community. Stephens comes from a family full of elite athletes. Her late father, John, was selected 17th overall by the New England Patriots in the 1988 NFL Draft. As a running back, he went on to win Offensive Rookie of the Year and play six seasons in the NFL. Unfortunately, he was killed in a car accident in 2009 at 43 years old, right before the U.S. Open. Her mother, Sybil Smith, was the first African American woman to be named a first-team All-American in swimming. She swam for Boston University and took sixth place in the 100-yard backstroke at the 1988 NCAA Championships. From there, she qualified for the Olympic Trials and then became an assistant coach at Harvard. Smith still holds seven school records to this day. She captured multiple titles as a junior tennis player, and played her first professional event in 2007 at 14 years old. Three years later, she cracked the top 100. In early 2013, she became a top 25 player by reaching the quarterfinals at the Brisbane International. Then she reached No. 11 in the world after she defeated Williams at the Australian Open.Stephens started playing tennis at 9 years old, when her mother and stepfather introduced her to the sport. She went on to train at the Evert Tennis Academy in Boca Raton and the Nick Saviano High Performance Tennis Academy. However, Stephens couldn’t carry that momentum any further, and in fact, her career stalled in 2016 when a stress fracture in her left foot kept her off the court for 11 months. So, what did she do with her time? When the injury forced her away from tour life last year, Stephens suddenly had time for things she had given up: weddings, baby showers, her cousin’s soccer games. Most important, she had more time with her grandparents, whom she calls her best friends. During that time, she partnered with Soles4Souls, a Nashville-based organization that aims to “Wear out poverty” by creating sustainable jobs, and collecting and distributing shoes and clothing all over the world. No matter what happens with the rest of the U.S. Open, Stephens is already a winner in our book because she’s serving up aces where it counts.